Robert Noreika is a prominent painter whose work hangs in both corporate and private collections throughout the United States, Europe and Japan. Robert’s passion for art is matched by a natural talent to paint a wide variety of subjects, highlighted by expressive coastal scenes, intimate woodland pictorials and seasonal treks through the countryside. He has illustrated magazine editorials and seven books; the latest, Marsh Morning is now available in book stores. 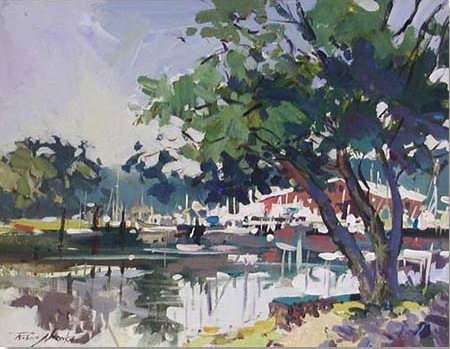 Robert is an Elected Artist member of the Lyme Art Association, Signature Member of the National Casein and Acrylic Society, a Signature Member of the New England Watercolor Society, as well as a member of the Connecticut Watercolor Society and the Salmagundi Club in New York. Robert’s work is represented in numerous galleries and he is a popular instructor and lecturer throughout New England. He has received numerous regional and national awards, and his work is part of the permanent collection of the New Britain Museum of American Art. The LAA extends its congratulations to Robert for recently winning two major awards: The Alden and Mary Bryan award in the New England Watercolor Society’s 2012 national exhibition, and the Robert Sanstrom Prize and Gold Medal in the National Society of Painters in Casein and Acrylic’s 2012 national exhibition.